In a small boat, right in the middle of the sea, the mandarin caught them In his parental wrath he was about to beat them to death when divine intervention caused them to turn into a pair of turtle doves. 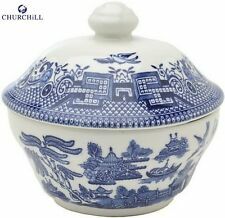 CHURCHILL WILLOW COUPE BOWL. SET OF SIX. We aim to get your ORDER to you as FAST AS POSSIBLE! Set of 6 Churchill pottery Willow pattern SOUP, COUPE,FRUIT bowls 8"
A SET OF 6CHURCHILL WILLOW PATTERNED SOUP BOWLS. NICE SHALLOW COUPE BOWLS AND 8" WIDE. THE BOWLS ARE VERY CLEAN AND UNCHIPPED. Boasting a detailed and striking design, this Georgian Sugar Bowl with Lid will stand out as a beautiful addition to your kitchen! Australian Body Care. Capacity: 160ml. Product Specifications Wooden toys. CHURCHILL WILLOW 15.5 BOWLS. Colour: Blue. Shape: Mint. We aim to get your ORDER to you as FAST AS POSSIBLE! We will always describe the pieces honestly and to the best of our ability. Colour: Blue. Shape: Mint. We have a dedicated team to answer any queries you may have. We aim to get your ORDER to you as FAST AS POSSIBLE! 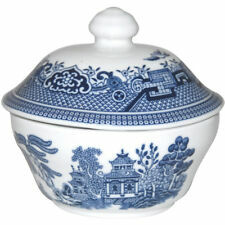 This listing is for 4 bowls in the Willow pattern Pattern , made by Churchill pottery . Fully marked. - See pic. Size: - Approx. 6 inches 15.5 cms diameter Condition - No chips, cracks or repairs...see pics. CHURCHILL CEREAL DESSERT BOWLS X 6. ~BLUE WILLOW~. YOU WILL RECEIVE 4 BOWLS. LIGHTLY USED AND IN VERY GOOD CONDITION. More Willow up on sale. 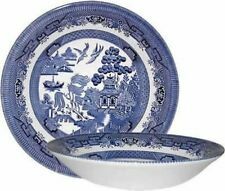 Set of 4 Churchill England Willow Pattern. Cup (H)7cm, Saucer 14cm ,Side Plate 17cm, Bowl 15cm.